When the clock struck midnight Monday morning, Fifth Harmony used the Notes app to reveal that Camila Cabello would be working from somewhere else indefinitely. More specifically, they revealed that Cabello’s representatives informed them that she would be working from somewhere else indefinitely. This is an important distinction, as it suggests the Fifth Harmony workplace was far from harmonious. You Harmonizers have been there with us since the beginning, you’ve supported us, you’ve rejoiced and cried with us, you’ve grown with us, and with your love and support we will continue on. We are four strong, committed women who will continue with Fifth Harmony as well as our solo endeavors. Harmonizers, we are in this together. We love you with all our hearts. 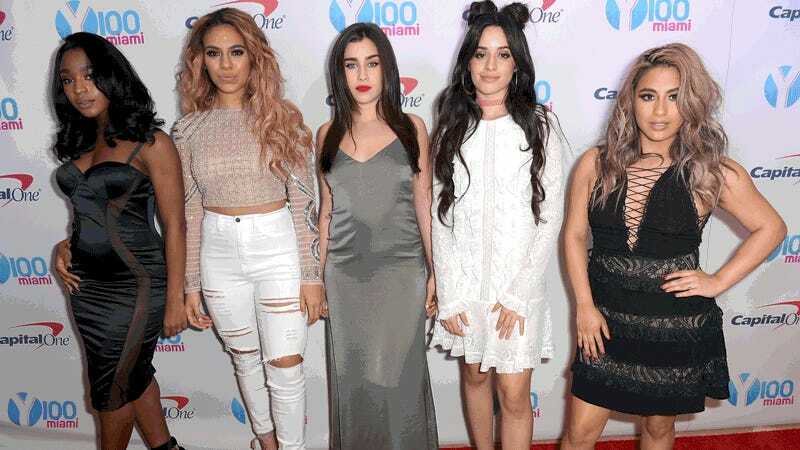 Congratulations to Ally Brooke, Normani Kordei, Dinah Jane Hansen and Lauren Jauregui. You four are still in the running towards becoming America’s next top harmony. Mariah Carey is reportedly still wearing her $10 million engagement ring despite the fact that she stopped dating the man who gave it to her some time ago. If the rumors about James Packer are true, I respect this subtle act of aggression. Rihanna did the “JuJu on Dat Beat” challenge.